Babbling Brooke: Patriotic Enough for Two! I finally found my Konad stuff - yay!! I had let my plates scamper out of my Konad plate case (aka a photo album) and run amuck all over my house, but I have finally located all the little scoundrels and have them back neatly in their case. I found my stamper, but no scraper, so for this mani I used an old gift card. The gift card worked well as a scraper, but not great. I need to find my scraper! 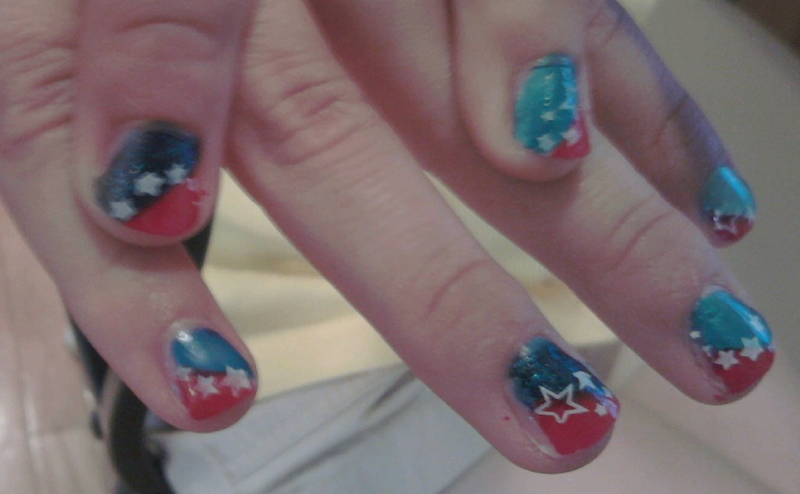 So today I have my first Fourth of July mani!! I used the gorgeous new blue from Nicole by OPI, A New Kind of Blue (I'm telling you - this is the perfect patriotic blue!) and my Kiss Nail Art striper for the white stars. I believe that this is a fake Konad plate, so I don't have a plate number for you today. And, unfortunately, the cheapie Sally Hansen topcoat I used smeared the design on my middle finger (that's what I get for not using Seche!). I painted half of each nail a different shade of blue, and then the other half of each nail is Nicole by OPI Really, Really Red. I used the Kiss Nail Art white striper and the same Konad plate as I used in the design above (I alternated between two different star designs). Today was the last day of class with my wonderful students. I coerced them into taking a group photo (they grumbled, but complied after I offered up some chocolate chip cookies). I will miss this group - they were really great. The hubs' office puts on a BBQ every 4th - only this year it's on the 3rd. Other than that, we'll be trying to stay cool and trying to keep the kid from going crazy. Can I give you a tip? When using stamping plates, I've had much better luck with not smearing the designs by using Out the Door, as opposed to Seche. and I have had GREAT luck using Nfu-Oh A&A topcoat after stamping. I have this plate too! I love your patriotic mani and I love the mini patriotic mani even more! So sweet!!! Both look great! I understand trying to polish tiny fingers that only stay stil for 1/10000000 of a second. Hi! I love these designs, I like how stars look like on the nails.